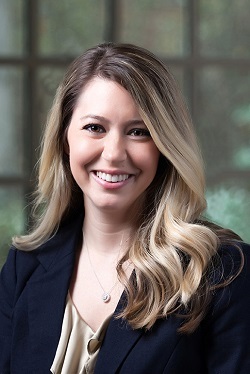 Erin is a member of the firm’s estate planning and probate section, specializing in assisting her clients with the preparation of trusts, wills, powers of attorney, and guardianship and conservatorship matters, as well as with the drafting and filing of probate petitions. In addition to her estate and probate work, Erin also assists clients with family law matters, including divorce, child custody, and child legitimation. A native of West Monroe, Louisiana, Erin holds a Bachelor of Arts degree in History, with a minor in Political Science from Louisiana State University. Erin obtained her law degree from Louisiana State University’s Paul M. Hebert Law Center in Baton Rouge, Louisiana. Erin practiced law in Louisiana until 2013, when she moved her practice to Georgia. Erin enjoys giving back to her community through various volunteer roles, including as a member of the Newnan Junior Service League. She is a member of St. Andrews in the Pines Episcopal Church in Peachtree City, where she serves on the Vestry. She lives in Peachtree City with her husband, Brian, a financial advisor in Peachtree City, and their daughter, Annabelle.